Who controls the narrative on the environment? Nereus researchers have been delving deeper into work on coastal Indigenous fisheries and as they develop relationships with Indigenous community members around the world, some are starting to rethink many of the core concepts of ocean governance. Foundational ideas like the environment, natural resource management and knowledge itself. As researchers of the human-ocean ecosystem, how has our understanding of these concepts impacted the questions we ask and who we ask those questions of? 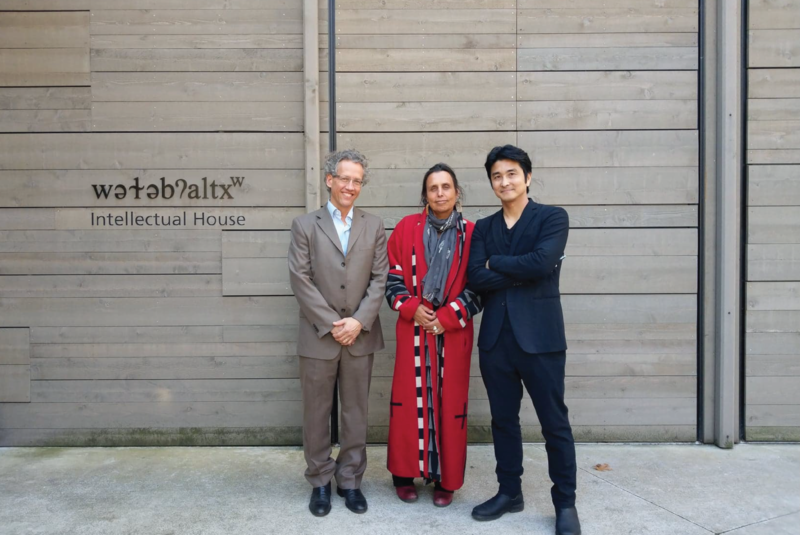 Nereus Program Policy Director, Yoshitaka Ota, had the opportunity to discuss some of these ideas with leading Indigenous scholar, Winona LaDuke when she visited the University of Washington in March. For more than 40 years, LaDuke has promoted social, economic, cultural, and environmental justice for Indigenous communities, working within White Earth Reservation in northern Minnesota and across the globe. Here is her take on some of the questions we had. Yoshi: So I have a few questions lined up here, but the first one I wanted to ask you is simply, what is the environment? Winona: Oh, everything is the environment. It’s of land, it’s of water, there are a lot of worlds that exist in our territory, and all of those worlds are our environment. The “environment” as many people think of it is certainly a Eurocentric construction. My reality is that I see a lot of living beings—let me give an example. I’m working on an environmental impacts statement on a new pipeline through sovereign tribal lands near Lake Superior. When I interviewed people, they told me about mermaids in the lakes. Mermaids that live there. Now, I know those don’t exist in the scientific studies, that’s not what we’re talking about. But in my world view, I know those beings exist. They are known unknowns, spiritual elements of the natural world. Yoshi: When people talk about their exchanges with indigenous groups, they often talk about indigenous knowledge, and describe it through the lens of using it for something else. Using it for conservation or better management or other things. I feel very uncomfortable with that. For me, that type of knowledge—it’s much more of a history. What happened to the place, the struggles, it’s not just, when can I harvest this plant, when can I cut this bush. There’s so much more to it than that. Time was a common theme in the conversation. The disconnect between the timelines of European histories and Indigenous ones wove it’s way into every anecdote. Yoshi: You’ve mentioned the privilege of living in the same place as your great-great-great grandfather, of pride and connection to that continuity. From that vantage point, how do you view environmental change? Winona: Well, that brings us to the idea of ecological amnesia. I spend a lot of time with elders and, for example, I feel like I remember a time when there were blueberries on our territory, even though I haven’t seen actually them. Because the elders told me they were there. I was interviewing one old man, and we got to talking about this, and during the interview he stopped me. “Can you bring back the blueberries Winona? We used to burn for them, they responded well to that. Can you bring them back?” It really gave me pause. What a concept, to be asked if I could bring back the blueberries. You asked about change, what am I trying to say…I can see what they’ve done. She said “they” in a way that filled the room. In a way that made everyone pause—look inward, look at the manicured lawn outside, the landscaped shrubbery, the paved roads, the stone buildings, all on the land that we know belongs to the Coastal Salish people. She said, “I can see what they’ve done,” in a way that made us see it too. Winona: I can see what’s not right. And I can also see how it’s supposed to be. I can see places that still have wallows for buffalo. I know what happened. I see that there used to be buffalo there, there used to be elk there. But, I’ve also seen things come home. Change is inevitable. It’s a question of who controls the change. If there is going to be change, I want some agency over it, you know what I’m saying? Because the things they brought, didn’t go over so well. You’ve seen what has happened, they clear-cut, they laid to waste – the state of Minnesota has laid to waste my territory. Yoshi: And how to you react to the idea of a pristine environment? Winona: All of these places that were “pristine”, were managed by us. We took care of our trees to create a maple sugar bush, we burned for blueberries, we planted things. There was a covenant with the place that we lived in, those resources weren’t our right, they were our responsibility. We understood that if you took care of the place, then you could always eat there, always survive there. We understood not to do dumb stuff. I feel like Indigenous…not management, I hate the word management it’s such a Eurocentric word….Indigenous knowledge and practice, is essential to long term sustainability. Northern Minnesota is a perfect example. The Menomonee reservation has the same number of trees today as they did 150 years ago, even though they’ve cut the reservation the equivalent of three times over. They used an integrated forest management plan, and it worked, really well. Then you see the Eurocentric racist white privilege of natural resource guys on the other side of things, Yosemite Park is a perfect example. When some people tried to put a round house down there for their ceremonies, they were forced out. Yoshi: Because it conflicted with the park management’s idea of pristine didn’t it? Many tend to draw a line between nature and people. Winona: That’s who they are and how they see it. They are all about power. I’m a lot more about responsibility. Yoshi: One last question. There were a number of young people here at UW who were very excited to meet you and who obviously look up to you. What do you want to tell those young ones? Pristine, management, knowledge, humans, nature, environment. As scientists, we’ve been trained to draw such clear, unquestioning lines around these ideas, to compartmentalize the people, plants, animals, thoughts and systems that make them up. It’s time to think deeply about where those lines came from and who they benefit. It’s time to think about erasing them. On behalf of the Nippon Foundation Nereus Program, we’d like to sincerely thank Winona LaDuke for sharing her time and insight with such candor and openness.